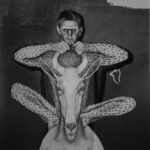 For its 2018’s edition, AKAA – Also Known as Africais pleased to announce the exhibition Unleashed, showed for the first time on a fair in Europe, a collaboration between the artists Roger Ballen and Hans Lemmen, presented by ARTCO Gallery, booth C6. 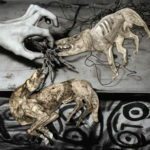 We met Roger Ballen in May 2018 on the occasion of the opening of his solo show at ARTCO Gallery in Aachen. Interview by Mathilde Lepert & Brigitte Bollé. You have done several artistic collaborations throughout your career, like with Asger Carlsen, Die Antwoord and more recently with Hans Lemmen. What are you looking for in these collaborations? What role do they play in the development of your artistic work? It is always difficult to quantify how collaborations have influenced my aesthetic, nevertheless it would be naïve to dismiss their impact. The work I created with both Asger Carlsen and Hans Lemmen helped my ability to integrate visual iconography into my photographs. The relationship I have had with Die Antwoord was particularly important as it introduced my imagery to a sector of the population that might never have come across my work. Furthermore, through the videos I made with the band I realized the impact of creating in this particular media. I have produced a number of important videos since the viral video with Die Antwoord I fink u freeky. How did you and Hans Lemmen meet each other in an artistic way? I meet Hans during my show at Het Domain in Sittard in the Netherlands. He and I immediately found that we had common interests. We both were interested in aspects of the history of the Earth, Hans in archeology and I in geology. His use of animals in his drawings was inspiring and he was a true craftsman. After some years of discussing how we might cooperate we decided that I should send him photographs which he would cut, paste and draw either on or off some of his existing work. Correspondingly, Hans sent me original cutouts which I blended with photographs of mine. Upon completion, I photographed the image and printed it like I would have any other pigment print of mine. You studied geology and psychology. Is it where your interest in the human psyche comes from? I can trace my interest in the human psyche to my University period from 1968-72. I was very inspired by works of psychology, philosophy, literature, theatre, and poetry that attempted to delve into the essence of the psyche. I was particularly interested in animal psychology and the relationship of the animal mind to that of the human. Do you consider the human psyche to be made of many strata to explore and discover, like in geology? Human consciousness like the strata of the earth has evolved over billions of years of evolution. When one looks at an ancient rock one can only guess the environment in which it was formed, the human mind is similar as it is almost impossible to fathom how and why we evolved the way we have. Ultimately, the psyche of all living organisms remains a mystery, an enigma. It is my hope that the human figures on my images are metaphors for the human conditions. I think the reason so many people remember my photographs is the fact that they identify subconsciously with my subjects. In other words, aspects of their being is located in my images. Is it a form of therapy? Do you express inner feelings through your art? My images are psychological in nature and as a result there is a direct link between who I am and the work itself. When and how did your interest in photography emerge? My mother worked in Magnum in the 1960’s and then started one of the first Photography Galleries in the United States. She was the first person to promote Andre Kertesz and became friends with a number of great photographers such as Cartier Bresson, Elliot Erwitt, and Bruce Davidson. Her passion for photography was passed on to me. When I obtained a Nikon camera for my high school graduation I was immediately able to take photographs that still have meaning to me and others. 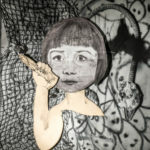 What does the mixing of photography with drawing add to your work, like in your series « Unleashed » presented at AKAA this year? The process of linking photography with drawing expands my aesthetic creating a presence that could not necessarily be realized through these medias alone. It should be noted that beginning to draw in 2003 started to become an essential aspect of my imagery and has pervaded my imagery ever since. Humans and animals side by side, as well as human-animal hybrid figures are omnipresent in your work, in an unsettling way. This is also something we find in Hans Lemmen’s work. What do these animals represent for you? Do they embody some kind of nightmares, monsters, human bestial impulses? This is definitely not the case. 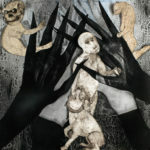 The animals in my work represent purity, godliness, and the place of nature that has been lost in contemporary society. The human being has created the nightmare for the animals not vice versa. Is it what real freedom is for you? Freedom is an overused word in contemporary society. We are never free from our condition as human beings and our biology. The best one can hope for is to recognize one’s limitations and use our short time on the planet to be a positive force whatever that term might connotate.